Opening Times: Club times (non exclusive) Tue & Thu 1800-2100, Sun 1000-1200. No public times. Pictures: Please browse the selection here. Click here to see pictures on the progress of the building of the clubhouse and the new runways with Mondo from Commonwealth Games track. Click here to see pictures on the progress of the building of the clubhouse and the new runways with Mondo from Commonwealth Games track. The track opened in 1989 and is on school grounds but is managed by Milton Keynes AC out of school hours. 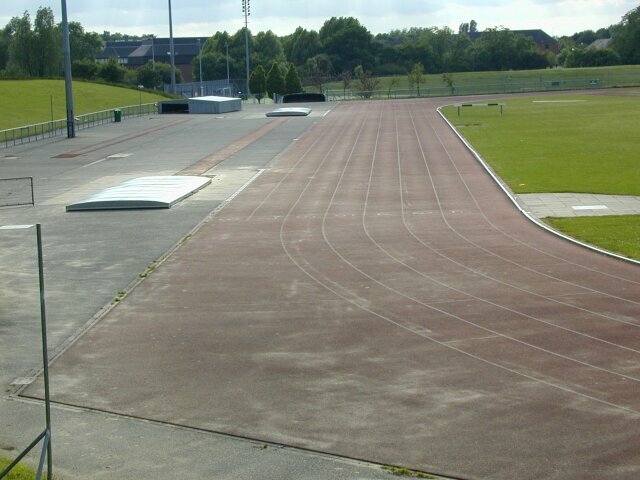 The track surface is Spurtan V. A bid for Lottery money to improve the facilities was made in 1996 but was turned down. However, in September 2003, a £415,000 grant from the New Opportunities Fund was awarded to build a new two-storey clubhouse at the track. Milton Keynes AC also raised a further £50,000. Work started on 1st Nov 2004 and opens on Saturday May 14 at the County Champs. During the same period, sections of the Commonwealth Games Mondo track have been used to provide extra protection for the high jump and pole vault areas, three 60m sprint/hurdles lanes adjacent to the long jump runway, an extra lane adjacent to the pole vault runways and surfacing for the timekeeper's stand steps that are used for bounding drills. More will be used at a later date to fill in the gap between the track and the clubhouse and to provide a rubber surface for the terrace and ramp. The JT runway synthetic (non Mondo) surface was renewed in May 2005.